This past week was difficult as not much happened due mostly to lack of time on our part and on the part of the people. This coming week is also going to be interesting because my companion can’t walk. He has some serious knee problems and this week we’re going to be getting every test that we can think of. This will allow the president; my comp and his parents to make the best decision. So with all of that in mind I’m a bit frustrated. Elder Garcia and I we worked so hard and nothing really happened. We saw a lot of good people get really, really close to making covenants with our Heavenly Father and then get cold feet or not do their part to receive the blessings. However the work of the Lord moves on. Again this week we will be in clinics and hospitals probably all week! It will be interesting to see what doors the Lord opens in this different setting, so I’ll let all of you know how it goes. We’ve already received a lot of support from the members here who are already trying to make plans so that we can still teach but it’s going to be difficult but then again, nothing worthwhile in life is easy! So we’ll really all we have to get the spirit and do all we can to help all the people we can! Thanks for everything and Have a great week. It’s Christmas! And it’s really, really hot down here. Yesterday it got up to 96 degrees! Anyway I figured I’d give you all the gift that is the dearest thing I own. I KNOW that God lives, He loves us more than we can imagine and He wants the best for us. His son Jesus Christ also loves us so much He gave more than just His life for us, He gave all He is for us! He wants us to be perfect so that we can become like Him and have the same happiness that He has. He’s given us the prophet Joseph Smith and the Book of Mormon so that we can know how we can do our best to achieve this perfection. He has also given us a prophet, even Thomas S. Monson who leads us as the mouthpiece of God. I KNOW all of this because I’ve done what I could to be ready and prepared to receive an answer from God by His Spirit. He answered me! I KNOW that it is all true and that with the help and through the atonement of Christ we might all be with our Father in Heaven again someday. First off I’m writing today because my comp was sick yesterday and by the time he felt better, we had to go to an appointment, so I’m letting you know I’m fine and you’ll get everything next week. This week was slow. The only people that seemed to be there were members that are less active. I’m devastated to think how the gospel could change some peoples, so many people’s lives, if only they would listen for a half-hour! But something interesting that did happen, my last comp Elder Vazquez contacted me to tell me that he is going to a different area a little bit early so he gave a report. Some of the investigators that he and I were teaching when I left, many have been baptized! The mother and daughter of Andre; Nilda and Coti, the lady from the Dominican Republic; Gorgina, the granddaughter of one of the members; Sofia (and her dad too! ), the daughter of a less active family that we were working with; Natalia (I had only met her like once), and a random contact that I remember meeting one night in the busy part of downtown; Norma (and her daughter! ), all baptized! So he didn’t really want to go but then again I didn’t want to either. It’s wonderful to know all of these people and the happiness that they now have and to think that so many more could feel that same way, have those and more blessings... if only they would listen. How many of us are listening to Him when he calls. I pray that we might always hear Him when he’s trying to help us, comfort us and guide us. Have a great week and I love you all. Chau! NOTE: 6 NEW PICTURES! CLICK ON THE PICTURES TO THE RIGHT TO VIEW THE PICTURE ALBUM. So as for Argentina everything here is way more expensive than in Miramar. A kilo of asado (meat) was about 20 pesos, here it’s 40 pesos a kilo! Everything they eat here is meat from the cow so it’s way hard to eat anything! This week we had divisions when I went to the downtown of the city. Oh yeah, I don’t think I mentioned which city I’m in, I’m now in Bahía Blanca! So I went with Elder Blackhorse and we had a blast and a lot of new investigators. That is the great thing about divisions, you get to work with another Elder and see how they do things then apply that into your teaching style and all of that, but at the same time I’ll never see those people again! We were able to explain how this church is the place where everything is at not just parts and that they can all find out for themselves if it’s true. Well I have to go but have a great week and thanks for everything! Well you’re all probably wondering why I’m writing on a Monday, well we had P-day change again so here goes a big story/miracle from the week. Let’s just say that it was one crazy Friday. So we leave in the morning and the first contact was a little interesting. He had a fly swatter of metal that was a pretty thick metal and he was playing with it while he talked. He basically was an old crazy guy so he like urges me to give him a short message so that’s what i did. About 3 minutes I talked then he started talking and after about a half hour of him talking about this and that, he starts talking about communism and how we’re communists and how the churches just help to keep the people ignorant and all of that kind of stuff. I decided to tell him that we needed to go. Well he first told me that I was ignorant then he told me that I need to learn patience and then that if we didn’t have time we wouldn’t have stopped in the first place. So he starts to get angry, really angry! I told him that our message is really important and that now we had listened to him for a half hour that now we didn’t have any more time for the moment. So he goes and grabs my arm and hits me on the head with that metal fly swatter thing! As we both start walking away very quickly, my comp also gets hit and so as we’re walking away he’s yelling communists, communists! So after all of that we go looking at a less actives house to see if he was there and a guy comes up to us and says hay I’ve got some people that need the missionary lessons. We’re thinking OK we’re down with that. As we start to follow him he leads us into like a junkyard area and we’re now just hoping that we’re not going to get robbed! However the tender mercies of the Lord were made manifest and we ended up teaching 5 people there that all have a day to get baptized the 30th of this month! We couldn’t believe it. They didn’t come to church because they all thought that it was a 9:30 at night and not in the morning. Well anyway time is ticking down but Have a great week! Chou! NEWS: SEBRING SANDS RECEIVED HIS MISSION CALL TODAY! He has been call to labor in the BRAZIL CAMPINAS MISSION. He will enter the Missionary Training Center in São Paulo, Brazil on March 30, 2011. 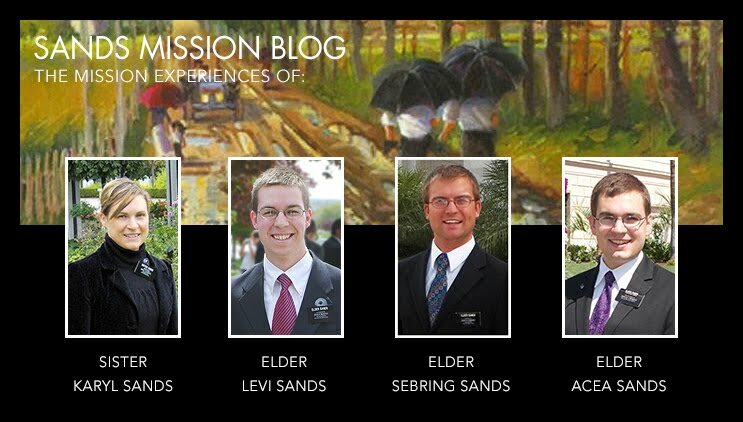 Follow the experiences of his mission here on the "Sands Mission Blog" beginning in April 2011. Well you're all not going to believe it but I'm in a WARD a real ward with a Bishop with two, yes two councilors with High Priests! I keep on pinching myself to try and see if I'm having the best dream of my life. My first day here we taught a lady and her brother who had lost his son about a year ago. At the end of the lesson they were both crying and couldn't wait to read the Book of Mormon. Also that same day with a couple, one that is from Brazil (she has a really strong accent but understandable) and although they have to get married once again they were balling especially her. They have a neighbor that is a member and he was trying to share the gospel with them. When we entered the house they said that they were very interested. I wish I heard that more often I just about passed out because of shock! Also that night a family that is less active were also in tears and they had really a change of heart. You could say you saw visibly the difference the spirit had done in them. Both my comp and I said things that weren't us. I had never said stuff like that before and he said that he hadn't either. Really it's amazing what the Lord can do and all we have to do is be obedient. My comps name is Elder Garcia and is From Texas. Well I have to go but Thank you all and have a great week! Sorry folks, I haven’t had pictures in a while. I haven’t been in a ciber that has been good in a long time and just a few days ago I lost my flash drive! I think I still might be able to find it but I don’t know. If so than I’ve lost almost all of my photos from Miramar; such is life. Well the President said that I was leaving to my comp; he told him that he needed to take lots of notes because I’m leaving this transfer. So that’s it i don’t really know where; not that’s it’s a surprise, usually more than six months in an area, well it doesn’t happen very often. So this week was busy! First we had a wedding on Friday! Yeah David and Danella got married and we were there for the signing in the public records place for most of the reception. They’re so great. Then David, Danella, their daughters and a friend and another Lady Andrea got baptized on Saturday! They’re each a miracle! It was a great day to say the least; to see people that are so ready to accept the things of the Lord is such a privilege! I love this work to see the difference that the gospel makes in the lives of people! Yesterday we went to Otamendi, a little city that is part of the rama to open up the predication more or less and we found this one lady that is also going to get baptized. In the beginning she was hesitant, really hesitant, but by the end she asked us to leave the Book of Mormon so she could read it. The spirit was so strong. My comp and I said things that didn’t make sense in the moment but they were answering her questions that we didn’t even know about! Well again, this week is transfers and General Conference. I don’t know where I’m going but I know I’ll be where the Lord wants me to be. Elder Marcos A. Aidukaitis was great! He dropped the cane! Left and right and we all came away a little bit bruised, but no pain no gain! As Elder Aidukaitis asked the missionaries what excuses might exist, my comp said "lazy comps". As I am training him right now or in other words, I am his first comp, everyone was kind of like "what is he talking about", especially the Mission President. His face was great. Let's just say that I'm not known for being a lazy missionary. My comp said it not because I'm lazy, but because he's heard a lot about some of them, so it was pretty funny. Elder Aidukaitis also is from Brazil and as a result he was falling into speaking Portuguese all of the time. We could understand him more or less but it was pretty funny and for some of the newer missionaries it was a lot harder. This weekend we're having a wedding, baptisms and confirmations. The Lord is a Lord of miracles and I've had the privilege of seeing some in my time here in Miramar. The Mission President said that I'm gone the 3rd of October and I'm sad to go but at the same time new challenges, new people and new opportunities to grow. I love the Lord, I love His Church and I love all of you! I'm writing today first because I didn't get too yesterday and I had to go on divisions and we had interviews with the President, so I only have a few minutes to do it today. Also, we have a bunch of citas (lessons) and the district meeting in like 5 minutes! So sorry but have a great week and I'll prepare a thing about everything that happened so I can just type it up and send it next week and save time. Tomorrow we have a general authority coming to Mar Del Plata and it’s Elder Marcos A. Aidukaitis a member of the first quorum of the seventy. The last time we had a seventy come he dropped the cane on the mission for that stuff that we weren’t doing right. I’m really looking forward to it. Also, all is going well here in Miramar! David and Danella are getting ready for the wedding the 24th so that they can get baptized the 25th then they’ll get confirmed the 26th! Also a girl from the Dominican Republic moved into the branch and her mom is now taking the lessons and she is so ready, the only problem she doesn’t think she’s ready so we’re going to show her that she is ready; well really were going to let her find out that she’s ready and have her ask God. That never fails. Also there’s another family that are amazing; the Mother, the daughter and the Granddaughter; they’re all going to get baptized. The daughter Andrea I think is the most involved of the three and the most excited to get baptized but the other two are really starting to feel and recognize the spirit more and that is making the difference. They’ll be in church this Sunday! Well that’s it; lots of teaching and that’s the way we like it! This week was once again fantastic! David, Danella, Agustina and Sofia are all learning and asking questions and progressing. Everything is really working out great. We've got so many people to teach! Just on the way here to use the internet we passed by a guy that is less active that wants us to pass by because he wants to come back! So we've also been trying to cut down a giant Eucalyptus tree that is in front of the house of David and Danella and its fun to say the least. They're trying to take it out so that they can continue to build their house. Well the work goes on. Have a great week everyone and thanks for everything. Well as for things going on here: yesterday was the 200th anniversary of the first attack on the Spanish here in Argentina to kick them out and it was a huge celebration! They made the biggest flag in the world here in Miramar, well the longest and wow it was long. How long I don't remember and I didn't see it but some members were telling me about it. It's been raining a ton here! There is mud everywhere! It's pretty annoying and one set of shoes are kind of wrecked out a little bit so I used the doc martins and well I'm glad I have them because they're great for the mud. So Mauro is getting baptized on Saturday! He's so good. We went over the baptismal interview questions yesterday with him and he's so ready! So it sounds like all is well in Spokane. I could use some summer like conditions; it's just rains and rains and rains some more! Walking the streets with all of this mud that I was telling you about is really an interesting task! Well I have to go now but thanks for everything! So sorry, I don’t have very much time today. I have a bunch of stuff to write to the Mission President about but I'll share one experience. There’s a guy that’s here that is incredible. He’s going to be getting baptized on the 29th of this month and he’s just so prepared. Even better, he’s 22. So we’re going to start talking to him about going on a mission. His name is Mauro Chapa and he’s the family member of a member that lives out here. He’s really excited to learn and well, he’s great. I really got to go. Well this week was pretty awesome. First I had zone conference and it was kind of weird. All of the workshops that the missionaries gave were so-so. However, President Detlefsen talked for a long time and it was amazing! I can't believe (actually I can) how every time, he knows exactly what I need to hear. I'm really going to try changing stuff that I do for personal study; so I can learn more and help my investigators more as well. So zone conference was amazing. Also we had interviews and the President had us prepare a sheet that had challenges that we have had, blessings that we have had, goals we have and other similar things. We got to talk a little bit about that and it helped me out a lot with some of the things that I was struggling with. Sunday morning an investigator that we have came to us and said he wanted to get baptized. He went to church on Sunday and he's going to be getting baptized the 29th of May! He's really excited and he understands everything! He also already has a testimony of the Book of Mormon and the church and the prophet Joseph Smith! So he's awesome. Also on Sunday, it being Mother's Day, I got to talk with the family! It was kind of weird; I'm not going to lie to talk to them again. They also told me that Acea is now taller than Sebring, how weird! Well today we went and saw sea lions. They are the nastiest creatures I've ever smelt! They were so bad I was gagging! Not the most pleasant but we took a whole bunch of pictures of the sea in Mar del Plata as a district and wow is was fun. We then we went and had an asado which is like a barbeque but argie style; really good. Well anyway I wanted to share a thought from the zone conference. The President referred to something that he noticed in 1 Nefi Chapter 2. They talk about how they left their home. They left everything to go to the desert which has nothing! They were obedient and when they found water what do they do, they give thanks because they now had water. They probably didn't give thanks when they were in their home because it was something mundane that they had all of the time but now they realized what the Lord gave them so they gave thanks. How many times do we forget to give thanks for the mundane things in life? Probably too often so I'm trying to focus a little bit more on the things that I take for granted and give thanks to the Lord! Well thanks and have a great week everyone. I heard from Sister Jones that a ton of General Authorities have been up there in Spokane! Crazy and all while I’m gone! It’s alright though, I have my own share. We had Stake conference; yeah stake conference, my first one since being on a mission. Anyway it was attended by Elder Sergio Avila. He, in the session for the adults (the best meeting I’ve ever been to in the church every time!) he talked about the plan of salvation. He explained things in a very different kind of way that just put more depth to the plan. One scripture he read was in D&C 93:33-34. The plan of salvation is so perfect our Heavenly Father knows what we need in order to be perfectly happy and he’s provided the way for us to obtain that. All we have to do is our part not because that’s the way he wants it, but because that is what we need to do to apply the atonement in our lives. That is how things are; those are the laws of heaven, and not even God can break them, because he made them. He loves us so much and so does our Savior! How blessed we are to know about all of this! Well thanks so much for everything, chao, and we’ll talk Sunday! This week I have to notes ummm sorry things about news two things of news que sé yo i don’t know English anymore. So first of all there aren’t supermarkets in Argentina well not really. But the 4 kisocos in our area are all on vacations except one so we went there and the lady who was working said hay elder I want my kid to get baptized he’s got 11 years and so what do I have to do or does he have to do to get baptized? Can you say miracle! We were a little bit surprised by that. Pleasantly surprised. We also got stopped in the street Monday by a lady that had a ton of questions that she wants to ask us and when she gets that answer she’s going to realize that this church is something more than just another church. It’s like my mission president said, when we get the answers to the questions of our souls that’s were the conversion happens. So also the second Wal-Mart in the mission opened and we got to go and yeah it’s outside my area by like 2 blocks so it’s pretty cool yes for all of you that know about my little thing about Wal-Mart well right now it’s the only place I can get grape juice that isn’t wine. That’s all they have down here oh and also peanut butter, also something that doesn’t exist down here. It’s kind of funny down here they’re pretty darn expensive! Well I’m running out of time so I’ll have to say chou! NOTE: 22 NEW PICTURES THIS WEEK! CLICK ON THE PICTURES TO THE RIGHT TO VIEW THE PICTURE ALBUM. This week was great we had Zone Conference and as always it was really inspiring. I really wish that we could have them more often. I learned a ton of stuff that I'm trying to incorporate more in the stuff i do as a missionary. Also this week we had someone that we were working with a little bit and kind of gave up on her but she showed up to church out of the blue! We were pretty excited about that. She is from a less active family that really are great and they all want to come back but they've just been wrapped up in stuff that they can't easily get out of now. So I heard the Olympics have started up, that's pretty cool. This year is something that is huge for Argentina, the World cup. Soccer of course is huge here and Argentina is in it again although they supposedly don't have a very good shot at winning still it's going to be really interesting when it comes around to seeing what preaching is going to be like. When the national team plays, the whole country shuts down and no one is out or doing anything except watching the game! It's crazy! Well this week we're going to try a few new things to get people excited to go to church and we'll see how it works. This week was another one of those that just wasn't the best. We had set almost 30 appointments and almost every single one fell though; all but one. O well such is the work. Yesterday however we found some interested people, actually really interested, so we're going to start teaching them. What's really interesting is that during my mission sometimes it just seems that about everything goes wrong and nothing seems to be working out, but you just pick yourself up and pretty much always that's when I see the best results is after a hard day or a hard week. So I'm now starting to see those people that really are ready to be taught. As for specific people we're teaching a ton of people that all have questions, it's just finding them that seems to be the problem. We're just getting out of vacations and there's a lot of stuff going on right now for the summer so when we can find them, their great, but when we can't, we just have to wait. Well we have Zone Conference Friday, so I can't wait! They're always so inspiring! This week was amazing! Probably the best in terms of work that I've had until this point in the mission. It's amazing what you can do when you're really organized. As for investigators, the family Villar still haven't gotten baptized, but not for a lack of wanting to, just because they are never home for us to teach them. So we're just going incredibly slow, well at least for this mission. They've already been to church 8 times! That's unheard of down here to have them go that many times. They love the church and know its true and the Book of Mormon too and all of that and not get baptized really fast, but oh well, like the argies say "es lo que hay". We've also found a ton of people that want to listen, now it just really comes down to who really wants to try and change some things in their life in order to receive the blessings that come from that. There is a peace and a calm in all aspects of our lives. So let's just make the changes and enjoy the blessings. Goodness, with Jeff (Elder Winkfield) returning from his mission, I'm going to be the only one in the ward serving! Come on guys, I don't want to be out here all alone! As for celebrating my birthday; actually, I kind of forgot all about it. It wasn't until a member asked "Your birthday is today ¿no? I was like ummm (looked at my watch for the date) and said yeah, it is. So that's two years in a row that I have forgotten my birthday. But thanks Ashley Simpson and Hna Robledo! I wouldn't have even remembered these two years if it weren't for them. I heard about Brother (Dr.) Rawlins helping in Haiti; that is so great that he was willing and able to do that. We had heard that is was about completely destroyed! Sounds kind of like the last days. We've actually had a lot of people ask us to pray for the Haitian people as we've talked to them. As for transfers, everything stayed the same so I'm probably going to stay here in Olavarría for probably three more months but the President may do something different. As for investigators there is an interesting thing with the Famaly Villar; they're not really in our Branch. It is a really complicated situation with them but they are so ready to get baptized. We've also found a ton of new people to teach. We're really trying to organize ourselves a bit better and it's working out great. Well thanks everyone and have a great week. I don’t really remember what I wrote last week but the Family Villar well we again have a date for them to get baptized. The father has to quit smoking but he’s really determined and they’re all really excited to get baptized. It’s really weird we have to teach them so much in so little time. The thing is they’re never home together so it was really hard to get citas (appointments) with them. We’re going to be reviewing stuff the day of the baptism with them. There is also another girl named Stephania that goes to another church that uses a lot of psychological stuff with a little bit of God mixed in to make people feel good. They’re really big around here but she asked, “Why do I feel good there but also I feel really good when I read the Book of Mormon?” I just said that it’s because they do have a God and other good things that help people but they don’t have it all and because you know that the Book of Mormon is true that means that they can’t have it all and that the happiness you feel when you’re there can’t last forever. It’s so true. There are people out that do a lot of good but it won’t bring eternal happiness. Only the authority of God given to man and our effort to do the best will bring the mercy of God into our lives completely. I know that’s true without a doubt because the Book of Mormon is the word of God that’s what it all comes down to; your testimony of that book. Sorry I'm writing a day late. We didn't have internet yesterday for technical errors. So as for the things that happened this week; well pretty much everything bad that could have happened didn't happen. Thank goodness, but it still wasn't that terribly great. Our family that is getting baptized (famaly Villar) they I think were out of town so they couldn't make it to church and we couldn't contact them at all. They're now alright but only have Sundays free. So we're going to have to teach them all really fast and in just a few visits in order to baptize them in January. I'm not really sure if they're going to get baptized in January because of the situation. Also I think I'm leaving here the 24th too so I probably won't be around to see their baptism. Such is the life. We taught this great guy yesterday. We actually were passing by for his wife but to our complete surprise he let us in and he is great; so prepared. It was a fantastic lesson and he loved it all. His name is Marcelo. All of the others that we were trying to teach went on vacation, so they're all going to get back after I'm probably going to be gone. Yesterday we went to centro (like downtown) and my companion was looking around for stuff to buy because he is going back to Canada in March. So he was kind of window shopping and I learned later a game that is very Argentine it's called truco and it's really fun. Well I have to go but thanks for everything! You know what i hate cameras! I killed almost half of my time this camera works but I can’t take them out more than one at a time! grrr o well there is a saying here es lo que hay. so mom I expect to come back and see a lot less of you hahaha really bad joke! So Sebring is finished with scouts, that’s awesome, 7 palms! I didn't think I liked scouts a whole bunch when I was in it, but I’m glad I did all of that stuff now. Yeah I want to hear the songs! Has Sebring done his senior project or still no also what classes is he talking? This week was HOT! I heard it’s pretty cold up there but as for us down here, it’s terrible, really humid and really hot and every 4 days or so we have a storm. The weather is crazy down here in Argentina. I had a friend ask if it’s cold down here; I just saw that and laughed! I would rather be in snow than rain, but at least I’m not burning at all. So as for the people we’re working with; there is a family of three that are friends of some of the members that just showed up one Sunday! They have now gone 6 times and we finally took out the date of baptism with them and it’s really soon and they aren’t ever home at the same time so we are going to be over there a ton of times! Also we Baptized Andrea! She’s one of those people that are just golden! She did everything perfectly. She went to church, she never had questions because she always understood everything. She’s great and also her daughter who is turning 8 next month is probably going to get baptized too! Well I had problems with the camera again and I lost some time, but next week hopefully I’ll be able to send some more pictures.